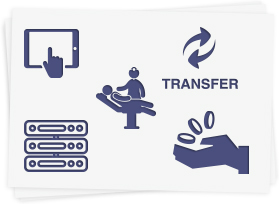 Patient collaboration, payers & providers; mobile information access. Reduce costs and ensure efficient utilization, while providing quality care in the face of The Affordable Care Act, regulation, and coding system reforms. The U.S. healthcare industry is experiencing widespread reform. The Affordable Care Act, regulatory mandates such as HIPAA, strict compliance rules, and coding system reforms like ICD-10 create significant challenges for healthcare providers and health plans. Reducing costs and ensuring efficient utilization while providing quality care is of utmost concern in the healthcare industry. Doing so under sweeping change is difficult at best. We help healthcare providers and health plans maximize their IT infrastructure and Big Data to streamline operations and gain insight into utilization, claims, and clinical imperatives. Our solutions improve collaboration between patients, providers, and health plans; simplify mobile information access; and enable better analytics and decision-making.